The first one said, "Oh my, it's time we ate!" The second one said, "There are spices in the air." The third one said, "And lots of TJ's fare." The fourth one said, "Let's munch & munch & munch." The fifth one said, "Let's have something with crunch!" 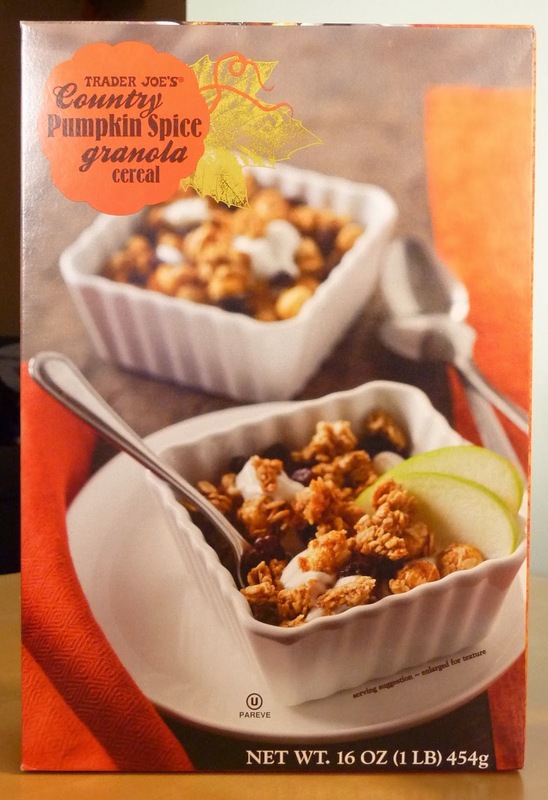 Then the five little pumpkins came upon a bowl of country granola. The first one said, "Hey, let's eat this stuff." And the second one was like, "Yeah, and let's put some pumpkin in it!" "Pumpkin makes everything better," said the third one. The fourth pumpkin added, "Especially around fall time!" But the fifth pumpkin shook his head and said, "Dudes, I'm not into cannibalism. In case you hadn't noticed, we are pumpkins." "True that, Number Five," replied pumpkin Number One, nodding. Just then, pumpkin Number Two spied some innocent raisin people nearby. They were a deep purple color, had wrinkly skin, and were very tiny, even compared to little pumpkins. Number Three had a sinister look on his face. He knew what Number Two was thinking. Suddenly, Number Four said it: "Let's throw them in instead." ...And that, ladies and gentlemen, is how this granola came into being. I recently made the observation that pumpkin-flavored products can taste very similar to cinnamon raisin products. That certainly applies here, where "raisins" are one of the main ingredients, and we see "dried pumpkin" after "vegetable oil" and "coconut" on the ingredients list. There's more coconut in this product than pumpkin, folks. It's not a terrible granola and raisin cereal, but I didn't find that happy homegrown harvest flavor I was looking for. There are hints of allspice, nutmeg, and ginger...and maybe just the subtlest ghost of actual pumpkin, but I personally wouldn't have minded a tad more pumpkin and nutmeg. Sonia agrees about the pumpkin, though overall, I think she enjoyed the hearty oats and wheat base of the cereal even more than I did. She gives this product another 4. I give it another 3, and the five pumpkins are just happy they didn't have to sacrifice one of their own. Ok, Nathan. I think it is safe to say that you have TRULY lost your mind. LOL! I totally read the first part of the post in that "sing song fairy tale rhymey" voice in my head. Then the pumpkin dialogue devolved into hilarious insanity. The pumpkin is gettin to ya man! The raisins in Country Pumpkin Spice granola cereal are ROCKS. Maybe if you cook the cereal they will soften up but I throw in yogurt with it- not cooked and had to carefully remove each raisin from my mouth and put them aside.